Rafael Sánchez was born in Badalona on January 25, 1974, but a few days after his family was born he moved to Mallorca. He discovered his passion for the profession at the age of 15 when he started a professional training at the Molino Verde, a family restaurant with Mallorcan and Castilian cuisine, where he started both in the kitchen and service areas. 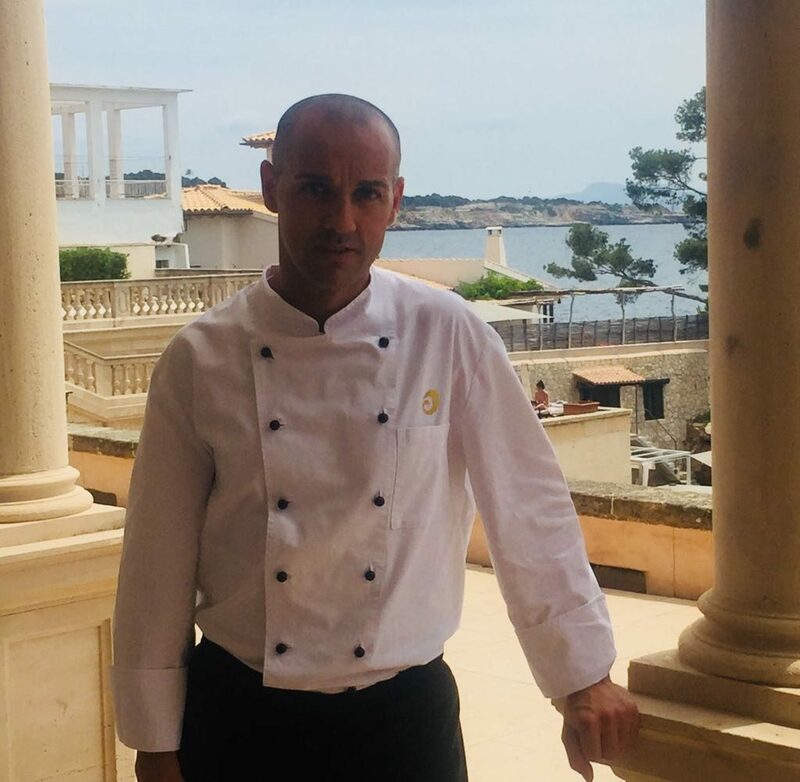 His first job was followed by several positions in different cuisines of the island, in 1996 he joined the brigade of Plat d’Or, the gastronomic restaurant of the Sheraton Mallorca Arabella Golf Hotel. In 2000, he was a finalist among 8 young cooks of the national Taittinger competition, three years later in 2003 he obtained the second place in the Balearic championship of young cooks. In the summer of this same year he was appointed head chef at Plat d`Or, with his great challenge of maintaining the Michelin star of the Plat d’Or, as well as directing the rest of the services of the hotel kitchens, for this he counted with the support of a team of 30 people. The features that define Rafael Sánchez are creativity, a deep knowledge of the raw material and a refined technique that allows him to develop innovative dishes. Its cuisine surprises with its light creations, its freshness, its original aromas and its striking aesthetics. In short, more than two decades of intense learning and personal growth pursue Rafael Sánchez, which has allowed him to create a culinary style of his own, authentic and honest. The ingredients of your recipes can be clearly identified according to criteria of shape, color, smell and taste. It prefers seasonal products and gentle cooking methods, as well as cooking with great respect for the environment. For him, one of the most sensitive products in the kitchen is the lobe of foie that can be prepared in various ways, but which needs careful control until its preparation. His favorite fish is the hake tenderloin, anointed with aioli, bakery potatoes previously candied in rosemary oil, tomato segments with garlic and parsley chopped, a few quarters and finally, all seasoned with salt and olive oil. The inspiration for your dishes appears spontaneously and can arise anywhere, at any time. To keep up to date, this young Mallorcan chef participates in training courses, eats in different restaurants, works with his team and reads and exchanges opinions with other colleagues. When creating new dishes, think first of your customers. Finding the taste of their guests is their main rule, to achieve it try to accompany their customers on a trip not only culinary but also emotional, as it is according to him, the only way to find the way back to his restaurant. For him a gourmet is not synonymous with caviar, oysters and champagne, a true gourmet is recognized for his love of food and drink and for the time dedicated to it. So it does not matter if you eat a good pizza, fried fish or a Mallorcan pa amb oli as long as each of these dishes is of great quality and has an exquisite taste. For all this, he is always open to include dishes by express wish of his clients. Rafael Sánchez calls himself a perfectionist, with a good dose of humor and total dedication to what is his passion ¨the kitchen¨. He loves that others cook for him, refraining from any criticism. In the course of his long career he has had the opportunity to work with great chefs, regularly discloses his knowledge and secrets in radio and television, is presented in different cookbooks and has received numerous awards. Apart from the cuisine of his country he loves Japanese cuisine. However, his favorite dish is still the blind paella. And to taste its cuisine there can not be a better place than Maricel Restaurant, where both the views of the Mediterranean and the art in its cuisine are endless. Undoubtedly, Hospes Maricel & Spa customers will have the privilege of tasting their creations and checking all these attributes in the first person.